Be part of the many events that RamstoreMall organizes especially for you. 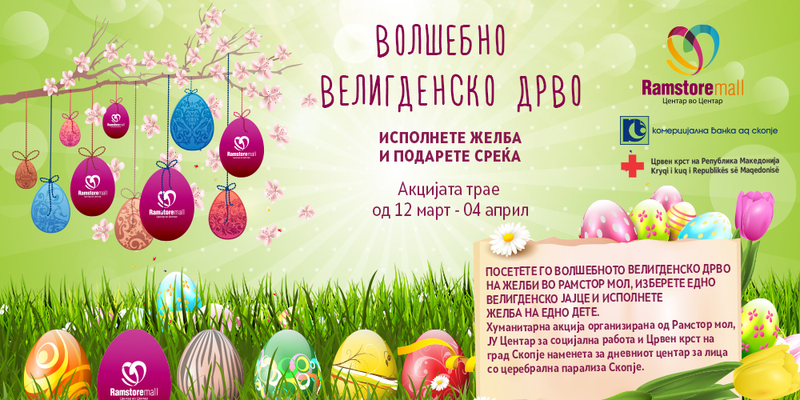 Ramstor Mall in cooperation with the Public Institution-Center for Social Work, the Red Cross of the city of Skopje and Komercijalna banka for the third year in a row is organizing a charity action titled “Magic Easter tree”. This charity action is organized for the daily center for people with cerebral palsy in Skopje. The visitors of the Mall, along with all human citizens and socially responsible companies are given the opportunity to be humane and fulfill at least one Easter wish of the children and youngsters visiting the daily center within the framework of the project which commenced on 12.03.2018. Namely, 50 children who are regular visitors of the daily center for people with cerebral palsy located in the settlement of Kapishtec in Skopje, have written their Easter wishes down and these wishes have been hung on the magic Easter tree in the Mall. Anyone who wants to join the action may come to Ramstor Mall and choose which wish he/she wants to fulfill. He/she may hand in his/her present at the Info desk of the supermarket operating in Ramstor Mall. The representatives of Ramstor Mall and other involved institutions are calling upon all citizens and socially responsible companies to take part in this action in order to jointly fulfill the wishes of these children and young people. Let us all together raise the awareness of overcoming the prejudices and stereotypes about persons with disabilities. This campaign shall last by 04.04.2018.